Old cross dogs never die. Last night did my first bike race in over a month, the NBX cyclocross 'under the lights' series. Great training series that represents (to me anyway) the soul of New England cyclocross. The bikes and gear may be more professional now, but the atmosphere is identical to what I recall back in the early 80's: Informal, friendly, enthusiastic. And above all, fun. 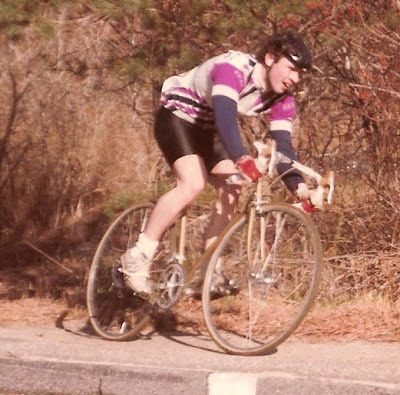 The photos on this post are from back in the day, taken at Plymouth and Wompatuck cyclocrosses back in '83. I was already into my 4th season of cross back then, a seasoned veteran at 23! Plymouth is not only the rock upon which the Commonwealth of Massachusetts was built, it's also provided a cornerstone for what's spawned what's now a vibrant New England cross culture. Images for today: Longbows and rainbows. For a post-world's hangover Monday, a few images remembering the last time a pro road rainbow jersey was worn by one of the Queen's subjects. Somewhere, Tom Simpson is looking down smiling, you can be pretty sure of that. I'd like to think so anyway. Simpson always believed that an all-British squadron could take on and defeat the best of the continentals on the road at their own game. He died valiantly trying to prove it back in 1967. And it's taken 40 plus years for another GB team to demonstrate it. 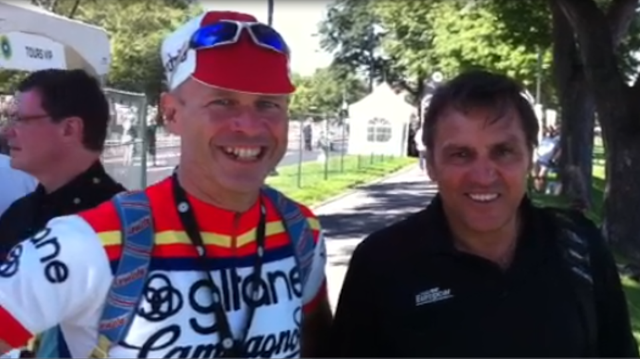 The ProTour race in Montreal was a great time as ever this year. Our gang of four Flahutes stayed at the Delta Hotel, dined the evening before at Les Pyrenees, and rode a few laps of the circuit early Sunday morning. Last year I wrote a post recalling the 1976 Olympics on the Mont Royal circuit. 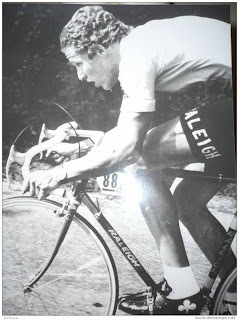 This year, as I soaked in the buzz of modern world class professional cycling, I couldn't help thinking back to the debut of this circuit on the international stage in 1974 - the year of was the setting for the final World Championship victory of Eddy Merckx. Back to reality over the past week, the announcement of the 2015 World's in Richmond VA, and the current 24/7 online video coverage of the current race for regenboogtrui in picturesque Copenhagen keeps memories of that '74 race popping back into my mind. 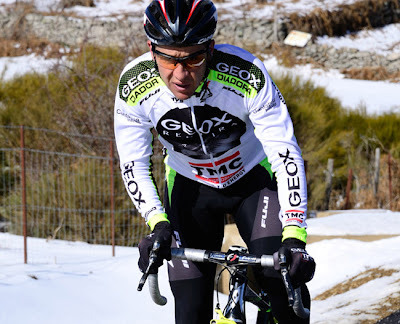 "Do not go gentle in that goodnight"
Carlos Sastre last week announced his retirement. Many cycling fans I've talked to locally in the past week barely noticed. (Oh yeah? Hey - who won in Montreal?) One understated press conference in Madrid, a tip of the cap, and adios amigos. A very recent Tour winner going so quietly into the night. The news seemed a minor footnote in the world's cycling press. Frankly, I've been expecting to see more follow on tributes than one quick news flash. This just doesn't sit right with me. Rendezvous JRB: The Quebec Connection. Just got back Monday from the annual Flandria cafe raid north to the Quebec City and Montreal ProTour races. Lots of raw material to write about. Here's a little hors d'oeuvre. One of my 'super-fan' traditions when watching Montreal is to wear one of the old retro team jerseys I've collected over the years. It's a great icebreaker with in-the-know-super-afficoionados who appreciate the rare, the retro and the old-school. It's also (in my own not so humble opinion) an understated, and appropriate way for an informed fan to make a 'style statement'. As opposed to...say...antlers. Noticed today in cycling news that Didi Thurau's son Bjorn (website here) has just signed a pro contract with Europcar (here). Well, if the kid is half as good as his Dad, it should be plenty good enough to be a great pro. God knows, he looks just like him. Apples don't fall far from the tree, do they? 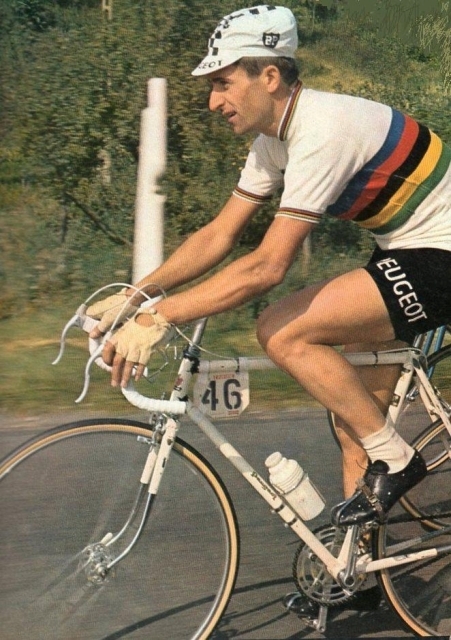 You don't see much written about Dietrich "Didi" Thurau in the cycling press these days. D'ya know his da? Let the ol' Flahute put him in perspective for ya.